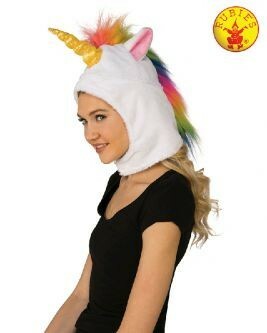 Who can resist the mythical, magical fantasy of the elusive unicorn? Are they real animals? Well, yes! Look no further, we have found her - complete with a golden horn and rainbow mane. 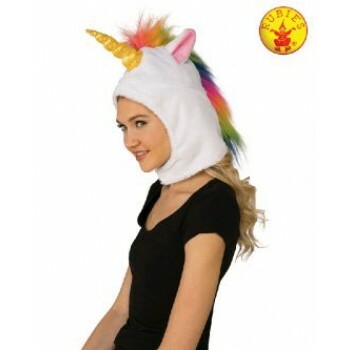 Includes one fluffy hood with velcro fasten under chin, sequin fabric unicorn horn sewn into forehead with stitching embellishment giving shape, fluffy ears with pink inner ear colour, and rainbow coloured faux-hair mowhawk mane. One size fits most adults.